This blog is about the daily activities in a busy typewriter shop. I want to share with you the many interesting people who come in here, the beautiful machines I get and most of all the great typewriter stories that people share with me! This machine comes in a beautiful case. You can still find these in good condition. It is strange to figure out the letter positioning on the index. Please click play to watch a 1 minute video of me typing on the Mignon. I took a little time to learn the index arrangement. 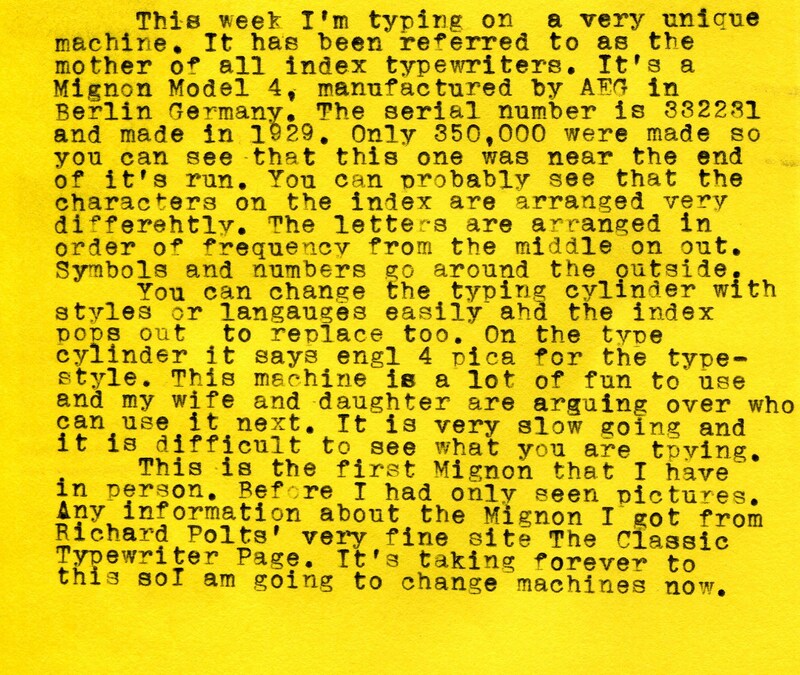 The typing cylinders and index are easy to change. All I can say about this one is - I want this! 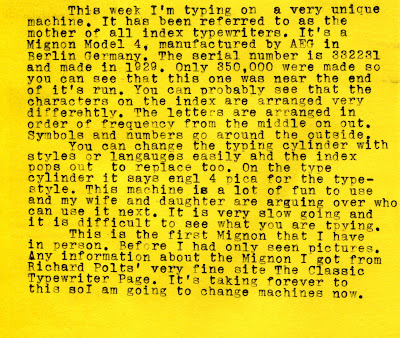 The index machine is something between a pantograph and a forerunner to the computer mouse! Cool video, a lot of people will learn from it. That is a drop-dead gorgeous red and black Royal! Heartwarming news about your shop and its customers, as always. Great post! Very interesting, post and video. 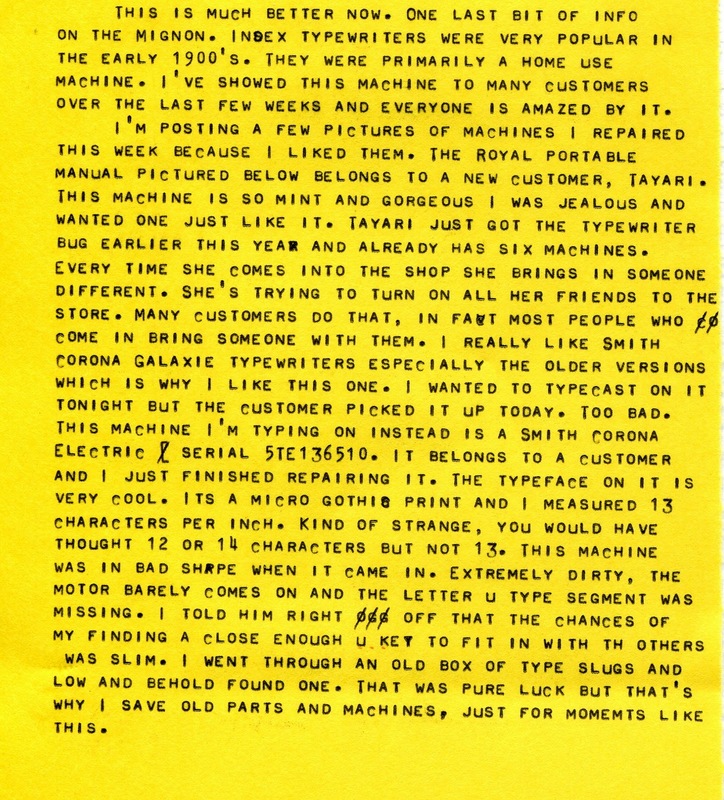 I have never seen anything written using an index machine. I have only ever seen the pictures on Richard's site and on another site, I think Adwoa's. 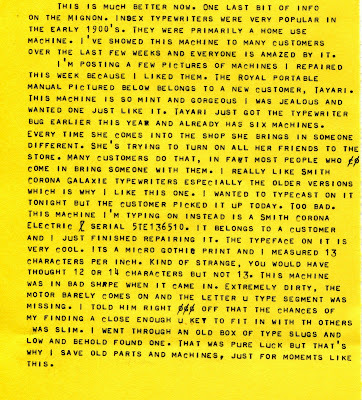 Very happy to see you are busy and machines are moving out into the world of typewriter users. Hey Speculator- Thanks a lot amigo, glad you enjoyed. Richard- That red and black Royal belongs in a museum. I wish I could film people coming in to buy a machine, it's just priceless to watch sometimes. Thanks as usual! Bill M.- I'm trying real hard to give these typewriters new life. I'd love to get more interesting machines in here to put on the blog. I was just admiring a Mignon on Retro Tech Geneva. I like "clever" machines. Also, do you happen to know the title of the Fringe episode? I missed it somehow and want to try to find it online. I sure wish your shop was nearer to me. At least I can get to Ace in a day. notagain- The Fringe show was episode #5 called novaction and originally aired on Oct.28. I missed it too but will look it up soon. thanks for the comments. I own a typewriter shop in Arlington, Ma. 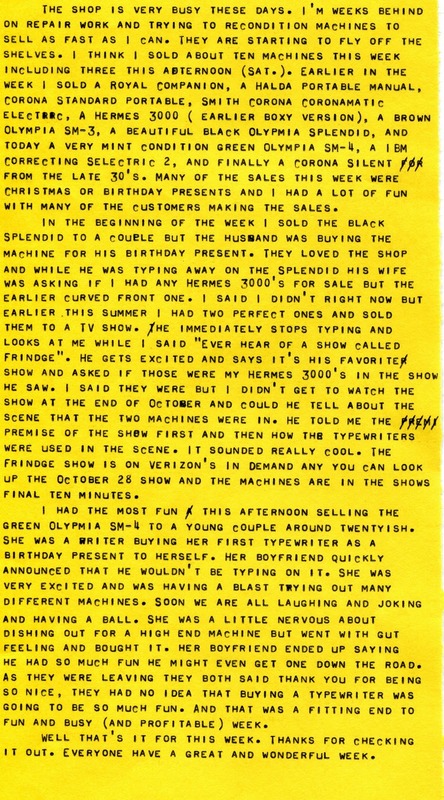 I love my job so much I wanted to share it with other typewriter enthusiasts. Cody says "If I can type anybody can"